First 20-cent cover price. Cover pencils by Gil Kane, inks by Vince Colletta. First 20-cent cover price. The Dweller in the Dark, script by Roy Thomas, art by Barry Windsor-Smith. 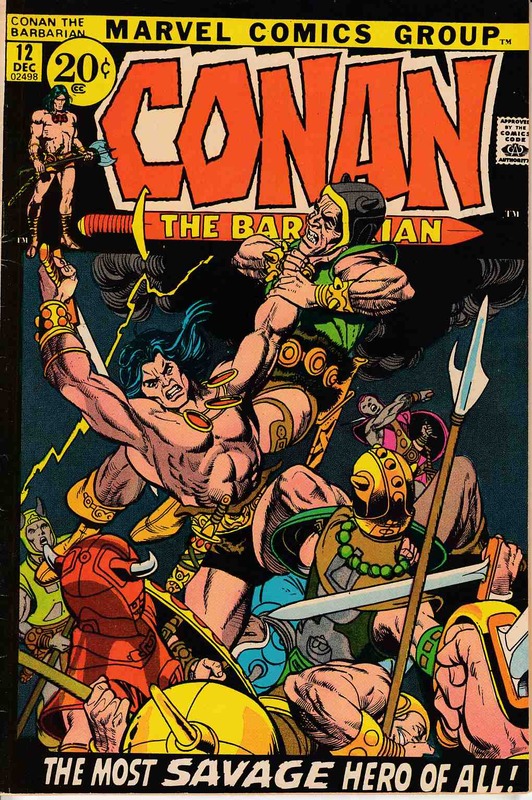 Corinthinan city of Zahmahn; Conan becomes Fatima's lover; Fatima throws Conan & Yaila to monster in dungeon; Conan escapes, throws Fatima to monster and makes Yaila the new Queen. This story was originally intended for Savage Tales 2 before it was canceled (the first time). The art was altered so that it would pass the Comics Code and published here. See Savage Tales 4 for the original, unaltered version. Back-up story, The Blood of the Dragon, script by Thomas, pencils by Gil Kane, inks by Kane, Tom Palmer, and Berni Wrightson. *Grading Notes: top staple detached from cover.